The Governor’s Council on Climate Change is a really important forum to make sure Connecticut takes all the steps it can to mitigate climate change. The meetings are open to the public, who can attend in person or via webinar. But for those of you who can’t make it, we will bring the information to you through an ongoing series of blog posts. If you have thoughts you’d like to share, please email shannon.laun@ctenvironment.org. We will keep you posted on latest happenings at the Council, but keep an eye out for the parts of the process where you can provide input and take action. 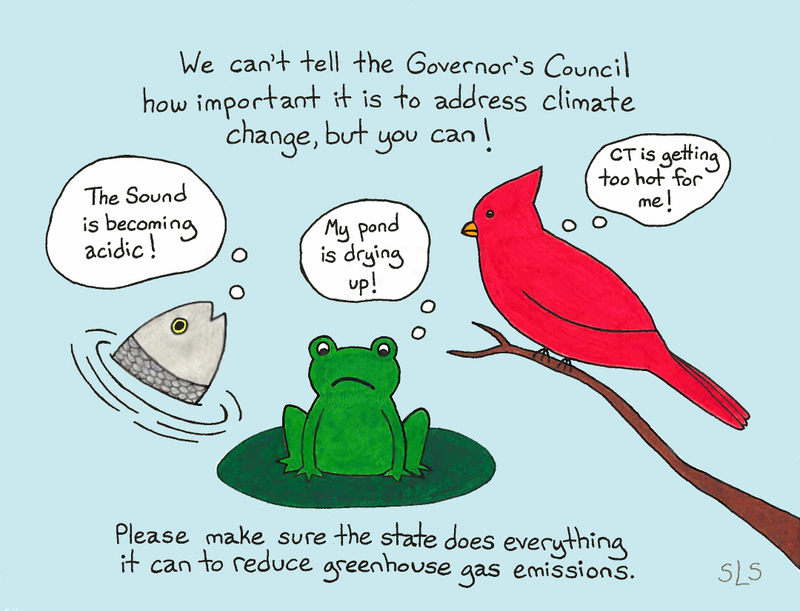 The Governor’s Council on Climate Change (GC3), which was formed on Earth Day, is meeting regularly to develop recommendations for reducing Connecticut’s greenhouse gas (GHG) emissions. Under state law, Connecticut must reduce its GHG emissions at least 80 percent (from 2001 levels) by 2050. The Council will issue its initial set of recommendations by January 1, 2016. The GC3 has formed two working groups: one to focus on leadership, accountability, and engagement, and another to focus on analysis, data, and metrics. CFE President Don Strait, whom Governor Malloy appointed to the GC3, is serving on both working groups. All working group meetings and meetings of the full Council are open to the public, and members of the public can provide input during the public comment period at the end of each meeting. In addition, members of the public can submit written comments to deep.climatechange@ct.gov. The leadership working group met for the first time on August 28. Members of the group discussed what it means to be a leader, existing leadership models, and ideas for how the working group can reach out to various entities, including municipalities, businesses, academic institutions, and nonprofits, to ensure that all stakeholders are engaged in the state’s efforts to address climate change. Several members of the public attended the meeting and offered valuable input during the public comment period. The analysis working group met for the first time on September 16. Members of Northeast States for Coordinated Air Use Management (NESCAUM) also attended the meeting. NESCAUM is doing technical modeling to determine what strategies are needed to reach the state’s 80 percent emissions reduction requirement by 2050. The group discussed how we should measure the state’s emissions (for example, should we only look at direct emissions generated within the state? Or all emissions associated with the full life cycle of materials and services used in the state?). NESCAUM explained the models it will use to conduct the analysis and its timeframe for obtaining results. NESCAUM should be able to tell us how effective various strategies will be at reducing emissions by June 2016. Fewer members of the public attended the analysis group meeting, but the comments they provided were insightful. The next full meeting of the GC3 will be on Tuesday, September 29 from 1-3 pm. Posted by Shannon Laun, energy attorney at CFE/Save the Sound.